This article is part of our special report An efficient energy union. The European Commission was on track to launch infringement procedures against member states that have not properly implemented EU energy efficiency law, Energy and Climate Action Commissioner Miguel Arias Cañete told EURACTIV. Draft conclusions for the European Council in Brussels, seen by EURACTIV, have efficiency laws on the agenda for the heads of state and government, as part of discussions over the new Energy Union. The draft, dated 9 March, represents a shift from an earlier leaked paper. Guidelines for the conclusions were circulated by the Council secretariat, to sketch out subjects for the talks. But the guidelines did not mention energy efficiency at all, and only mentioned renewables in the context of cutting national support schemes. Efficiency and renewables have a much stronger presence in the new draft, suggesting Council officials had reacted to feedback from the European Commission and EU energy ministers at a Council of the EU meeting last week. “One of the things we are doing […] and was asked by Member States to do, is to implement fully the Third Energy Package before coming up with new legislation,” Cañete said after the Council of Ministers meeting. As well as “fully implementing and rigorously enforcing” existing laws, reviewing energy efficiency and renewables legislation to ensure the EU hits the 2030 Climate and Energy targets will be on the EU leaders’ schedule. Plans to overhaul the EU’s electricity market were due to be discussed. But now the document states that the overhaul must help integrate renewables. The measures are outlined in the Energy Union communication, launched on 25 February. It is the EU’s strategy to bolster its resilience to shortages and lesson its dependence on Russian gas. How the governance of the Energy Union will work is one of the key questions policymakers must answer. Yesterday in Strasbourg (11 March), MEPs raised concerns about the lack of efficiency on the earlier paper during an Energy Union debate. Belgian Socialist Kathleen Van Brempt said she wanted it to be discussed by EU leaders. “We’d like to emphasise the importance of energy efficiency,”she said. “40% of the EU’s energy demand is in buildings, and much of that is from gas heating. Better insulation can be Europe’s secret weapon against dependency on Russian gas supplies,” said Brook Riley, a campaigner with Friends of the Earth Europe. 75% of the EU’s building stock is highly inefficient, said Cañete last week. “This is a clear area where the possibilities are enormous,” he added. Despite that, the Energy Efficiency Directive, and articles related to the performance of buildings, were areas where member states were more at risk of infringement than others, he said. EU countries have primary responsibility for the correct and timely application of EU Treaties and legislation, and the Commission monitors the application of Union law. If no solution can be found at an early stage, the Commission can open formal infringement proceedings and eventually refer the Member State to the European Court of Justice. 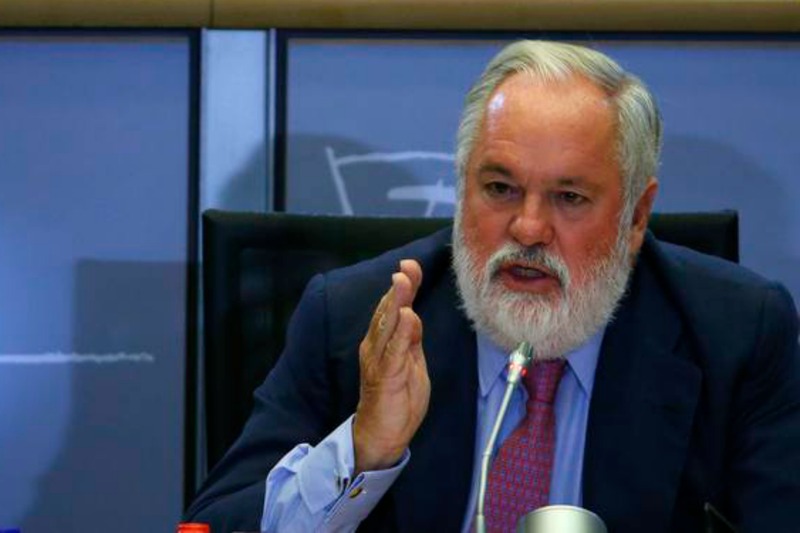 “The Commission is on track at the moment to launch all infringement procedures against all the Member States who have not applied the regulation in many areas – but mainly in energy efficiency,” Cañete said. Asked after the press conference which states in particular were in the firing line, Cañete told EURACTIV any country not properly implementing the laws would be targeted. The Commission will adopt its next monthly infringement package on Thursday, 26 March. The executive would not reveal whether any more procedures were planned. Maroš Šef?ovi?, the Vice-President in charge of Energy Union, said tougher action would be coupled with financial incentives to launch a European movement for efficiency in EU buildings. The Commission would develop new financial instruments to promote the retrofitting of buildings with the European Investment Bank and other financial institutions, he said. “So we will try with this double approach. Better regulation, but at same time financial incentives for starting what I hope will become a European movement for efficiency in our buildings,” he added. Proceedings against Greece, Portugal and Slovenia for failure to fully implement the Energy Efficiency Directive began last month. They were formally requested to use energy efficiency obligation schemes. Slovenia was told to submit a national energy efficiency action plan and strategy for investment in building renovation. If it did not within two months, it will face possible European Court of Justice action, the executive said in a press release. In November, Greece was asked to comply with obligations under energy efficiency in buildings legislation. Bulgaria and Hungary were asked to fully transpose efficiency rules at the same time. Belgium, Finland, Poland and Austria are subject to proceedings begun under the Barroso Commission. All were referred to the Court of Justice in July 2014 for failing to fully transpose the Energy Performance of Buildings Directive. They now face fines. Member states have only half-heartedly embraced or are simply non-compliant with the EU’s Energy Efficiency Directive, which came into force in late 2012, according to analysis by the Buildings Performance Institute Europe last year. Under article 4 of the directive, countries are obliged to publish national renovation strategies. The plans are needed to drive investment in renovation and in the supply chain, which could have a knock-on effect on economic growth and employment. Six EU nations, Greece, Hungary, Luxembourg, Poland, Portugal and Slovenia, missed the April publication deadline by six months. Other member states, such as Austria, Denmark and the Netherlands were not compliant, according to BPIE. France, Germany and the Brussels Capital Region were just partially compliant. The research showed that the United Kingdom, Czech Republic, Romania and Spain’s strategies were acceptable, but there was still room for improvement. But the European Union institutions’ buildings policy in Brussels has also been criticised in the past. It was “unambitious” in terms of energy efficiency, according to the European Court of Auditors. Green building standards and initiatives promoted by the EU for greater efficiency are not consistently employed for new buildings or major renovation projects. The report exposed shortcomings in the approach of the European Commission, European Parliament and EU Council, as well as other EU organisations, looking at 2005-2013. The European Union's Energy Efficiency Directive in late 2012 was expected to trigger the largest revamp of Europe's existing building stock to date and set new standards for public procurement and energy audits. But implementation of the rules at national level has been poor.